Is The Ringed City a fitting farewell to Dark Souls? I can understand the temptation of the hollowing comparison, but I think William was too eager to employ it. For example, the first part of this is about killing those angels and finding a way back through the area. The placement of their killable counterparts, the way treasure and shelter are dotted around the area, these provide examples of the deliberation William felt was missing. As for the abundant callbacks, personally, I would have been disappointed if this, the final installment of a beloved series with rich lore, had all been about new characters and places. And actually, I thought there was too much new stuff in there. I wanted to fight Frampt, or maybe one of the old gods, take a walk around Ash Lake again. Isn’t the final part of something a time for reflection? I was absolutely thrilled while traveling through The Ringed City, especially after reaching the city itself. I didn’t mind the rushing through areas because there was always a way to clear whatever it was that was forcing you to rush, then slowing down afterward. Instead, what it provided was a feeling of accomplishment whenever you figured it out, and I haven’t felt that for a while in the Souls series (and I actually think DSIII is my favorite of the series, despite getting every one of these games, including Demon’s Souls, on opening day). And the bosses were the cherry on top. 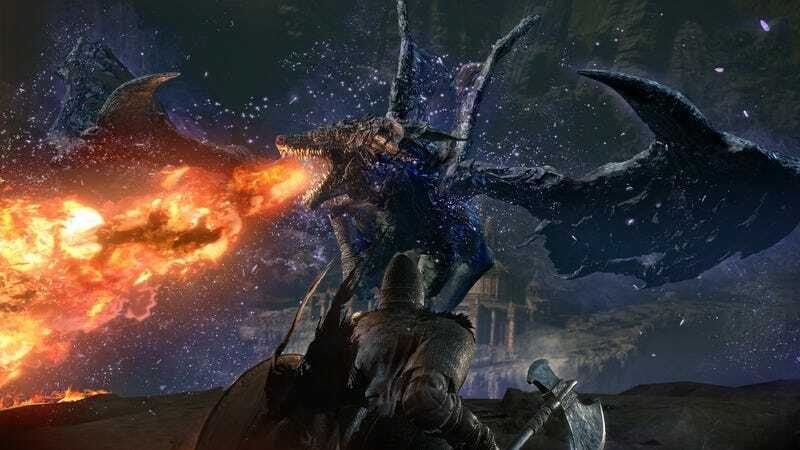 Midir was especially satisfying, and the final boss was epic. The Old Monk-like boss was a nice callback with a twist and the first boss was tragic (and in a surprising location, too!) I don’t want to write too much here because part of the wonder is not knowing. I suppose my feeling toward this final DLC could be a result of just knowing it’s the final new Dark Souls I’ll experience, but I really thought they did so much right here. They went out of their way at times for fan service, but it was also in service of story and lore and had little impact on the gameplay itself. And for someone who’s watched and read quite a bit of lore, I appreciated the effort. I can agree with the sentiment that it’s time for From to move on from Dark Souls, but I really thought this was a fitting end in almost every way. Gael was a great final boss, and I was completely satisfied. He’s basically the inverse of Gwyn. Where Gwyn is a royal god of sunlight who is all about destiny and lineage, Gael is a slave knight who is human, dark, and overcomes what should be an ignominious fate to meet you at the end of the world. Fun fact: This was going to the featured image for the last part of my review—and then I noticed Ryder was BLINKING. Good lord almighty does this sum up my relationship with this God-foresaken game. My problem with this game is that it was so damn dull. The planets were boring, space sudoku was boring, the crew was boring and the lengthy animation between every damn planet made me want to kill someone. It is a game where I would want to wander off to do something else. But it’s most serious sin is that it’s a space exploration game that misses the entire basic structure of the space exploration genre. The planets were nothing. You weren’t discovering anything. There wasn’t a gimmick to most of them. The planet with the poison and the out of control ecosystem was functionally the same as the ice planet that was functionally the same as the desert planet. Instead of at least some kind of planet of hats approach, there was the same pseudo mystic race of space Australians on every single world. That would be fine if they were interesting, but instead they were already the same as every other generic pseudo mystic alien race in every B-tier science fiction story. It is actively bad at being what it was trying to be. I wish BioWare would commit to making aliens…alien. The most alien of the Milky Way races›the hanar, elcor, and volus—got diminished into jokes and set dressing by the end of the original trilogy. The two new races here have no qualities that make them uniquely Andromedan, or really anything unique, as far as aliens go. I’d like to see some viable races that are less anthropomorphic. One of the places that Andromeda struck me as an improvement was in the writing of some (almost all) of the relationships—both personal and professional. In the better examples, like Jaal or Drack, these relationships struck me for progressing more organically towardstrust and sharing than I remember in past installments. Add to that the fact that Andromeda seems more invested in building out networks of relationships beyond your squad—Sloane and Reyes; Tann, Kesh, Addison, and Kandros; Moshae Sjefa, Evfra, and Avela. While given nowhere near the depth of core team relationships, they help provide a sense of extended family that seems right in line for the setting. For all these developments, the romances still feel as underbaked as ever (a few notable exceptions aside), and the MM options especially so. I’m aware that the issue managed to get on BioWare’s radar in the most recent announcement, but it’s also not clear to me what’ll be legitimately improveable given the existing options. Tomorrow is April 8, which means it’s time once again for the Gameological community’s monthly Mario Kart 8 On The 8th event. Perennial racing mastermind DL won’t be able to make it this time around, but Venerable Monk has stepped up to host. All you have to do is boot up the game at 8 p.m. Central, head online, and search for room 0699-6646-7941. You can check out DL’s post in this week’s What Are You Playing This Weekend? thread for the rest of the details. This’ll be the last one before Mario Kart 8 Deluxe on the Switch is released. Now, I’m not saying the Wii U game should be abandoned, but I do wonder if there are enough Switches out there among the commenteriat that we could pull off gatherings on each? Just a thought. In any case, thank you for reading and commenting. We’ll see you next week!